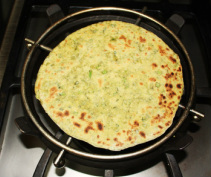 Methi ki roti is healthy and tasty. 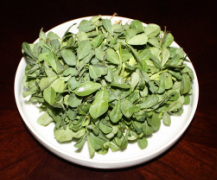 Methi is also known as fenugreek leaves. 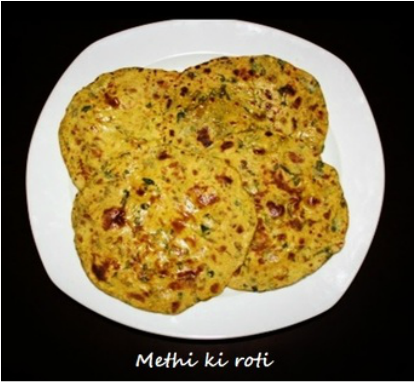 This roti is a simple way to add methi in your regular meals. 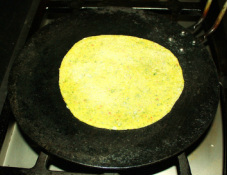 To prepare methi roti coarsely chopped methi and spices are added to whole wheat flour and with the water kneaded into the dough. 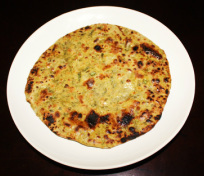 The small portion of the dough is rolled into roti then roti is partially cooked on hot griddle then cooked directly over flame then methi roti’s are lightly coated with ghee. 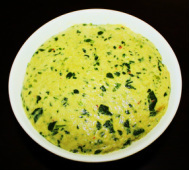 Methi roti goes well with any dal or any vegetable curry. 2. 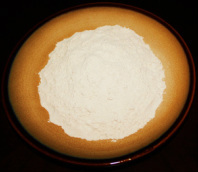 Place the whole wheat flour into a bowl. flour and mix everything together. 4. Add a little water at a time and mix it in a rotating motion from the center of the bowl to outward until it form a dough and it cleans the sides of the bowl, knead it for few minutes, until the dough become soft and just the right rolling consistency. 1. Pre heat the tawa (cast iron flat griddle) on medium heat. 4. Dust your hands lightly with the extra flour, take a portion of the dough and roll it in between your palms in to a ball. 6. 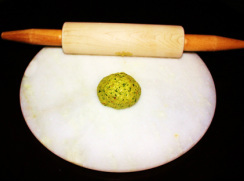 Now place the dough on the rolling board or chackla (Indian roti rolling board) and with the help of a rolling pin roll into a 6”circle or as you prefer. 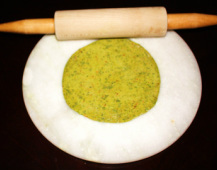 Methi roti is rolled thicker then chapatti. 7. Now pick the roti and pat between your hands for few seconds to shake off the excess flour. 8. 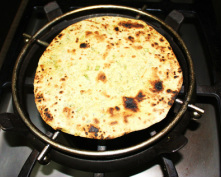 Place the roti on the hot tava (griddle), and let it cook. In about 30 seconds little bubble will start appearing with the help of a tongs turn the roti over to other side and cook for 30 seconds, if the roti sticks to the tava (griddle), it is not hot enough, if it is too dark or burn, it is too hot, adjust the heat accordingly. 9. 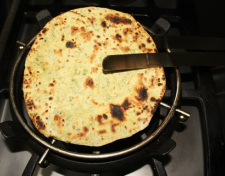 Once both side of the roti are cooked, then with the tongs (chimta) lift the roti off the tava (griddle) and immediately place it over the medium flame on the gas stove. 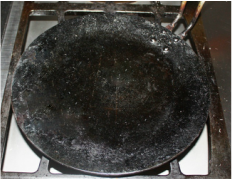 Keep moving the roti in a circular motion about all the time, cook on both sides over the flame. 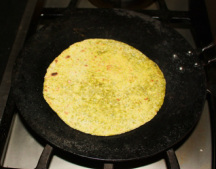 Methi ke roti does not puff up as the wheat roti and it take little longer to cook then chapatti. 10. When you see black or brown spots on both side of roti, and you have the desired crispness, take the roti off the stove and slap it lightly over the cooking board to take the flour out, and then apply some butter or ghee. Serve the roti hot. 1. Chopper could be used to chop methi. 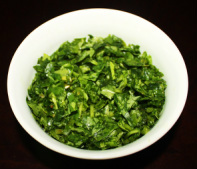 Methi leaves for Making Methi roti. 4. Make extra rotis and store them.